Philipp Kohlschreiber made it into the quarter-finals of a Grand Slam for the first time, ending US qualifier Brian Baker's fairytale run in a straight sets win at Wimbledon on Tuesday. The German 27th seed won 6-1, 7-6 (7/4), 6-3 in an hour and 55 minutes on Court 12 and now faces either French fifth seed Jo-Wilfried Tsonga or US 10th seed Mardy Fish in the last eight. Baker, the world number 126, lost six years of his career after five different operations on a hernia, then his left and right hips and finally his right elbow. He returned to college but eventually felt ready to return to tennis in July 2011 and the 27-year-old has enjoyed a remarkably successful time back on the circuit. Baker started the year ranked 458 but will break into the top 100 thanks to his Wimbledon exploits, with the American likely to enter at around 77. "It's been an unbelievable run. I can't be too upset about that, even though as a competitor I'm definitely pretty frustrated right now, to get that far, not to feel like I played my best match," Baker said. "Hopefully I'll learn from it and have more opportunities. "I don't know if starting first round qualifiers I would have thought I would have maybe gotten to the fourth round of Wimbledon. "I've gained a lot of confidence with my game and proven that I can stay healthy playing a lot of matches. "Since I've been coming back it's been about the health, and now it's about the game. So that's a good thing. It's been an unbelievable ride." Kohlschreiber goes fourth on the list of the most Grand Slams played before reaching the last eight, having got there on the 33rd attempt. Fabrice Santoro holds the unenviable record at 54, followed by Australian doubles duo Mark Woodforde on 38 and Todd Woodbridge on 34. "I'm very, very happy," Kohlschreiber said on going through. "I feel really great. For sure I have a lot of confidence now." The German made it into the last eight thanks to some 23 aces and superb net play. Kohlschreiber dominated the first set but Baker was a different prospect in the second, narrowly losing the tie-break. 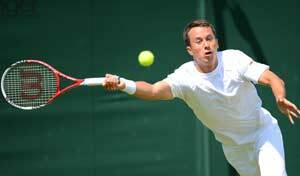 Kohlschreiber, 28, won the match in style with an ace. 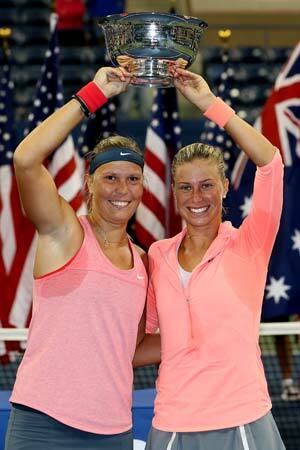 "After the match point was over, I was yelling, screaming. That's the kind of thing I do. And when I go back to the hotel, I will for sure celebrate some more," he said.